Your Brother is more than just a member of the family. He is the one who has always been there for you. He helped you out when times were tough and been there to laugh with when times were great. So searching for the perfect gift for your Brother can be a challenge. At GiftsForYouNow, we make finding the perfect Brother Gift a breeze. We offer a handsome selection of Brother Gift Ideas sure to warm his heart while making sure all of our Brother Gifts are extremely affordable. I really like the ornaments. I ordered 3 different ones. Great Christmas gifts. Feeling worn down? 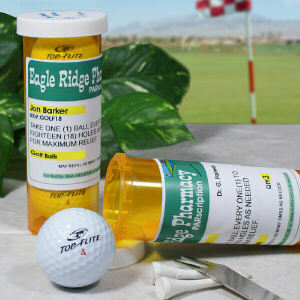 We have the golf prescription just for you. This adorable custom golf ball container will be personalized with any name (up to 30 characters) and contains six name-brand golf balls. It makes a great gift FORE any golf enthusiast! He is sure to look his best out on the green in this handsome golf polo shirt personalized given as Personalized Gifts for Him with his name. These 100% heavyweight cotton knit jersey polo comes in three great colors and sizes S-3XL and are perfect Personalized Men Gifts. Give the man in your life a special Father's Day gift with our Engraved Any Name Watch Box. Our beautiful Engraved Watch Box will be skillfully engraved with any name. This watch box provides an elegant way to display 4 timepieces and makes the ideal gift for Father's Day! Got a golfer? As far as being the perfect gift, this custom monogrammed golf shirt will be right on par. 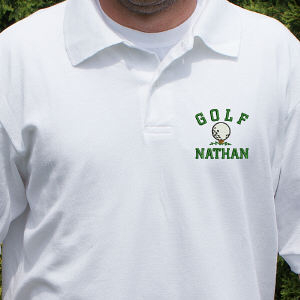 Our stylish personalized golf polo shirt features a golf club head design over the left chest and can be personalized with any name or initials! This 100% cotton, heavyweight jersey knit polo comes in white, black or navy and adult sizes S-3XL. It's the perfect gift "fore" any golf enthusiast! Everyone should feel like a star on their birthday. 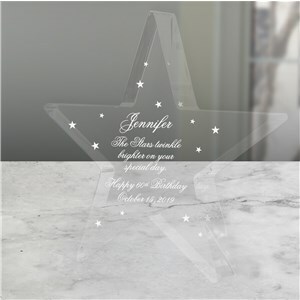 Our personalized happy birthday star will keep that special feeling going long after the birthday has passed. This elegant custom birthday keepsake may be beautifully engraved with any name (up to 16 characters), age and birth date. 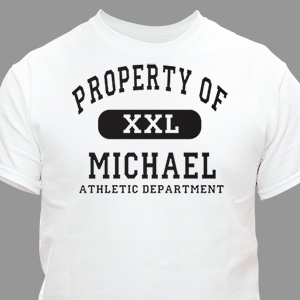 Any athlete would love this Athletic Department Personalized T-Shirts, regardless of sports preference or skill level. Customize with any name in your choice of print color! This classic sports Personalzied Shirt are 100% cotton and machine washable, and they come in white, ash gray or pink. Available in youth sizes XS-L and adult sizes M-3XL. 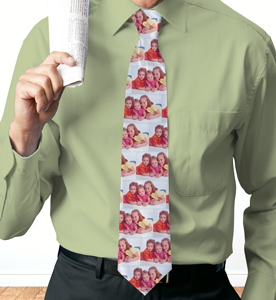 Dad never looked so good than when he puts on this Personalized Photo Gifts Neck Tie with his little angels. Your own personal message adds a finishing touch to these handsome personalized picture gifts or personalized gifts for Father's Day.These custom picture ties are made in the U.S.A. They measure 3.5" x 56" and are 100% poly-satin. Dry clean only. Why wear a boring tie when you can don a tie with custom photo and feel like a million bucks? If his heart belongs to golf, it will belong to our custom golfer's frame, too. 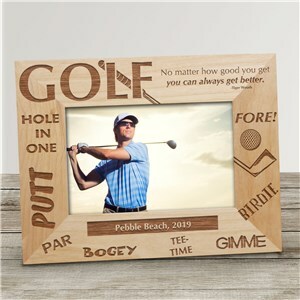 These personalized wood picture frames feature all kinds of golf terms and a quote by Tiger Woods that can be applied to many areas of life. In addition, each golf picture frame will be engraved with any custom message, up to 20 characters. Your engraved golf personalized wooden picture frames are available in a horizontal or vertical design, comes in three great sizes and includes an easel back for easy display. Show off those that didn't get away in your personalized fishing gifts photo album. 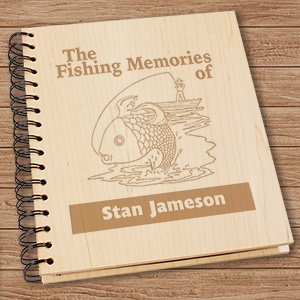 This handsome personalized fisherman's album holds 72, 4" x 6" photos and will be skillfully engraved with any name, up to 30 characters. 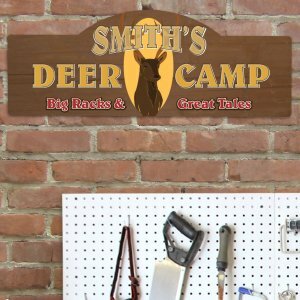 Big game hunting is your passion, so make sure your lodge, den or bar is decorated with the finest personalized deer camp wall sign around. This hunting design is available on our high gloss .25" thick medium-density fibreboard wall sign. Each 15.5" x 5.7" board will arrive with plastic peel and stick hangers for easy mounting. This personalized wall art is personalized free with any name. What do boys love more than sports, dinosaurs. 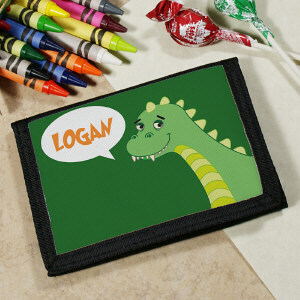 This fun and cute Personalized Dinosaur Wallet is perfect for any little guy who wants to keep his money in one location while have in a cool wallet to show to all his buddies. Your Custom Printed Dino Velcro Wallet is made from Black Trifold Nylon and measures 4.5" x 3.1". Includes FREE Personalization. Personalize your Dinosaur Wallet with any name. 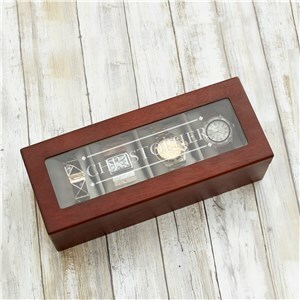 Give Dad a Father's Day gift he will use for years to come with our Engraved Dad Watch Box. 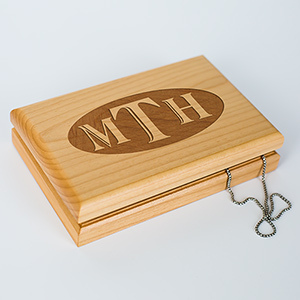 Our Personalized Watch Box will be specially engraved with any title and any custom message line. Makes a timeless gift for Father's Day! *Please Note: The item reads: "No matter how tall we get, we will always look up to you." Our engraved valet box makes a classy and unique gift for any recipient. This handsome personalized keepsake box is made of natural cherry wood, features felt-lined interior compartments and will be engraved with any 3 initials. A Personalized Valet Box is a great holiday, graduation or birthday gift! 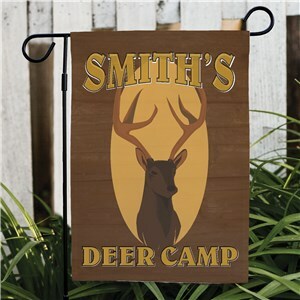 Make sure your hunting lodge or garden is decorated with one of these finest deer Personalized Garden Flags with custom name. This all-weather personalized hunting Custom Garden Flags are customized with any name, up to 30 characters. GiftsForYouNow offers many Brother Gift Ideas perfect for even the most hard to buy for Brother. If your Brother likes golf, you are all set. We offer many Personalized Golf Gifts your Brother will love. Or perhaps he is into home decor. We offer a wide array of Personalized Keepsakes from Engraved Keepsakes to Personalized Wall Signs.